Moraes Ices Assuncao In Rematch, Title Shot Next? The first time Marlon Moraes and Raphael Assuncao met in the Octagon, Assuncao edged out a close split decision. With both men looking to get the next bantamweight title shot against champion TJ Dillashaw, Moraes took the judges out of the equation with a dominant first-round submission win. Moraes showed off his striking when he knocked Assuncao down with a clubbing right hand and then showed he's a well-rounded fighter by locking in the guillotine choke. With three straight wins in under five minutes combined, there's no question Moraes deserves the next title shot at 135 lbs. 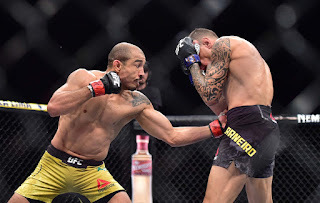 It looks like those back-to-back TKO losses to Max Holloway have awoken the inner beast in Jose Aldo, because since then he's destroyed Jeremy Stephens and Renato Moicano, who he brutalized in Saturday night's co-main event. Aldo's striking during the finishing sequence was a thing of violent beauty to behold, and at age 32 the former featherweight champ is heating up to make one more title run before his anticipated retirement in 2020. After losing three fights in a row, Demian Maia desperately needed a win and he got it when he submitted Lyman Good with his patented rear-naked choke. Considering Good was on a roll and had never been tapped out before in his career, Maia beating him in such a violent manner was an excellent win for him. It appears the old man still has some magic left in him at the age of 41. With his anaconda choke win over David Teymur, Charles Oliveira extended his UFC record for submission wins to 13, three more than the aforementioned Maia and the legend Royce Gracie. But perhaps even more impressive about Oliveira's performance was his striking attack, which looked to be much improved. Considering how good he is at BJJ, to see an evolution in his striking attack has to make you wonder if the veteran can finally put it all together and make a title run at 155 lbs. The UFC may have found a new global superstar as Johnny Walker needed only 15 seconds to brutally knock out Justin Ledet. Walker has now finished Ledet and Khalil Rountree in devastating fashion, and to go along with his striking skills he also seems to have a tremendous personality. The UFC looks like it has found the next big thing in Brazilian MMA. The UFC didn't award a "Fight of the Night" bonus, but if it did then Thiago Alves and Max Griffin should have won for their terrific welterweight battle that ended with Alves getting his hand raised by split decision. It appeared to be a very poor call by the judges, as most media and fans saw Griffin taking the bout. But considering it took place in Brazil, perhaps no one should be surprised. After struggling in the first round against Junior Albini, Jairzinho Rozenstruik turned things around in the second when he caught his opponent with a head kick and finished him off with strikes for his first UFC win. 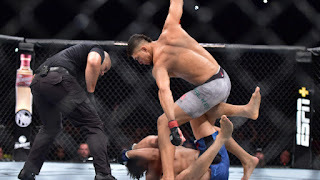 Rozenstruik made history by becoming the first fighter from Suriname in UFC history, and in a heavyweight division that is lacking prospects he could possibly be a hidden gem. 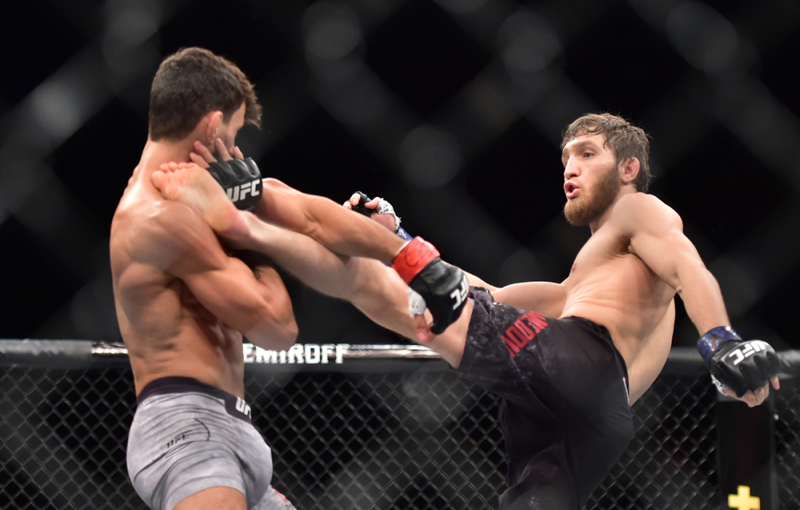 And finally, deep on the preliminary card we saw Said Nurmagomedov shine in his UFC bantamweight debut with a brutal spinning back kick knockout over Ricardo Ramos. With the flyweight division on the fritz, the early returns on Nurmagomedov's move up in weight look good, and it will be interesting to see how far he can go at his next weight class. Overall this was a tremendous card. Not only were almost all of the fights entertaining, but the pace of the broadcast was brisk and east coast fans were done watching before 11pm. 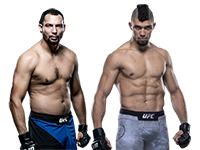 The UFC on ESPN era is off to a roaring start, and the great fights should continue with this weekend's UFC 234.